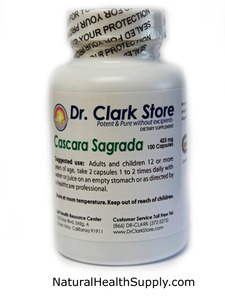 Each of the 100 gelatin capsules contains 425 mg of Cascara Sagrada, guaranteed pure and potent from the Self Health Resource Center. Warnings: Cascara Sagrada is a stimulant laxative. Do not use this product if you have abdominal pain or diarrhea. Consult a health care professional prior to use if you are pregnant or nursing a baby. Discontinue use in the event of diarrhea or watery stools. Do not use a laxative for longer than a week, or when abdominal pain, nausea or vomiting are present unless directed by a doctor. Rectal bleeding or failure to have a bowel movement after laxative use may indicate a serious condition. Discontinue use and consult a doctor.